Title photo: Ian Wilson’s O16.5 Everthorpe Quarry. See story below. in O and G (“Large”) scales. And don’t miss the “World’s Smallest” info below! Track is hand-laid using Code 70 rail to the gauge of ¾in (19mm). For an interesting trans-Atlantic comparison, see Steve Bennett’s very-similar British demonstration Gn15 layout in Scrapbook #6. 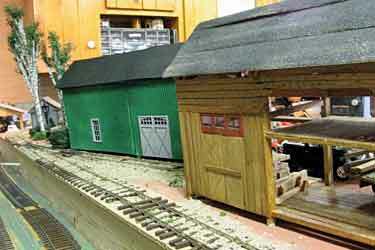 Rick Ludlow, from Medford, Oregon USA, is building his Basche & Wackett On30 railroad as several independent mini layouts. 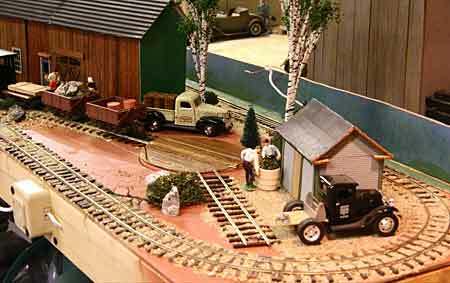 His B&W Maintenance Yard shelf layout was featured in our “Big Trains on Small Shelves” Scrapbook issue (#77). Shown here is an oval section of the road, designed to allow some continuous running as well as to provide Rick an area to practice scratchbuilding. Dimensions, like the Coffee Creek above, are 2x4ft (60x120cm). 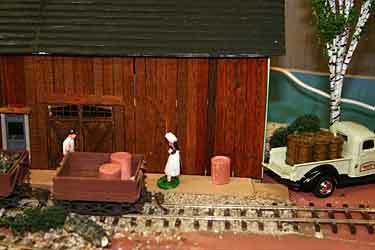 The photo was taken at the annual Medford train show, where Rick’s layouts are popular attractions. 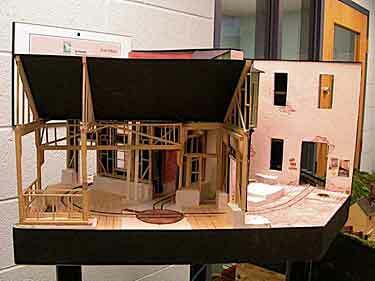 He got busy drawing up a 36x24in (90x60cm) version of the On30 Avalon plan (upper right) called Dominion Brick & Clay, then built a “picture frame” stage for it, complete with proscenium arch, lighting and backdrop. And as you can see (upper left), he made it to the show with a completed layout! 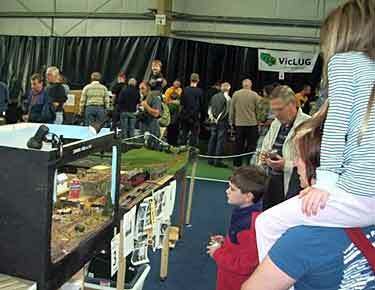 The layout was a hit at the train show, as you can see (above right). The baseboard is made from pink extruded polystyrene foam, cut out for harbor and creek areas. Track is Peco On30 in front and regular HO track behind the scenes. 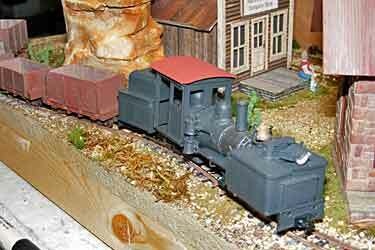 Motive power is a Bachmann Davenport gas-mechanical “critter” detailed with a Backwoods Miniatures kit and awaiting installation of a sound unit. Daniel managed to install an MRC ambient sound generator in time for the show, but couldn’t finish the diesel and railroad sounds installation in time. But he did have dogs barking, a cow mooing, and a church bell ringing in the distance (the bell nearly drove him crazy over the six hours of the show). 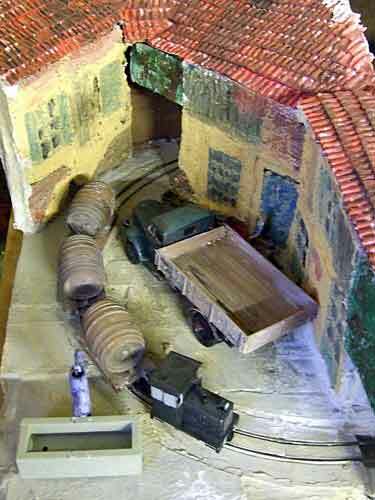 He did have time to add lots of scenic details to the layout. 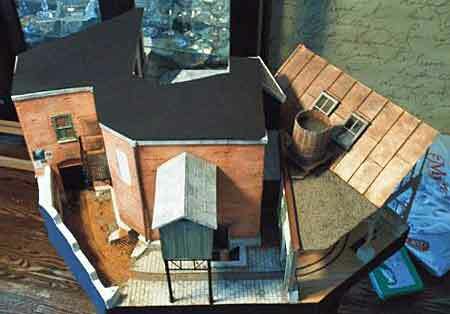 Buildings are mainly brick sheet over .040in styrene walls with commercial styrene details. “The main building has a mirror on the back wall and some LED lights, as have some of the buildings that sport windows. 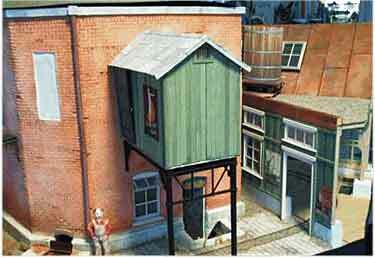 I also added a smoke stack to the original building cluster,” Daniel points out. 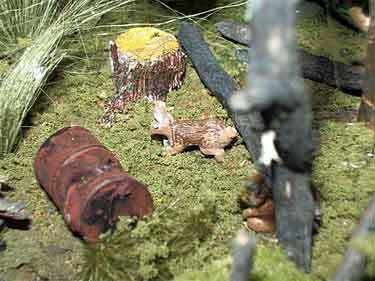 There are lots of other scenic details from various sources, right down to seagulls and a few rabbits. Lloyd Day, from Old Town, Maine USA, has built the C.C. Day Railroad (for his grandfather who owned a lumber mill), an efficient On30 oval layout in a 48x12in (120x30cm) bookshelf space. 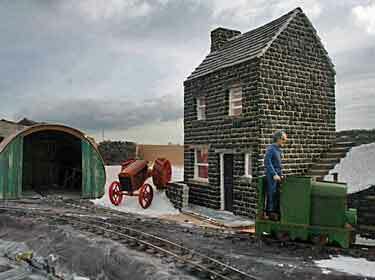 He uses Bachmann four-wheeled locos and rolling stock, which run just fine around the five-inch radius curves. 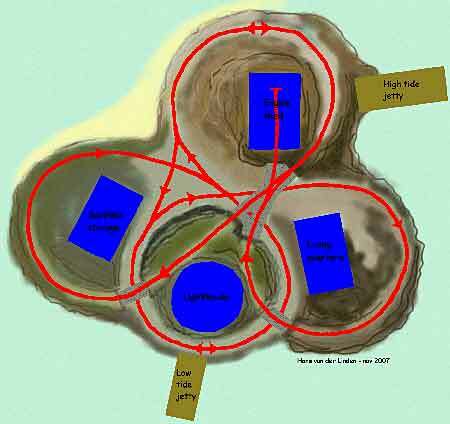 The track plan is very simple, with a left-hand turnout in each side of the oval to create two parallel sidings. 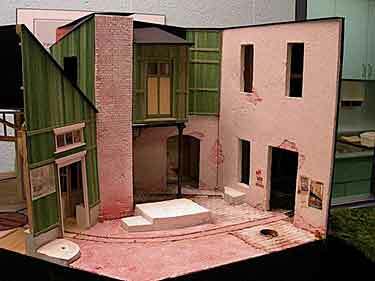 In between them, Lloyd has built a two-faced building, with a different side facing each siding. “I call it my ac/dc building, as one end and side have green board and batten siding and the other end and side have stained vertical board siding,” Lloyd explains. 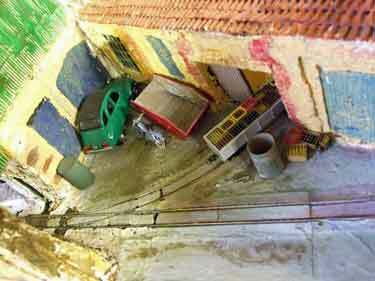 Thus he gets the effect of two car switching spots with just one structure! Russ built an 0-6-0+0-6-0 Garratt loco (lower right) from two LifeLike N 0-6-0’s, and it rounds the tight curves quite well! Another 2x4ft On30 layout is the Qualicum Sound Timber Company of Brian Durell, from Bloomfield, Ontario, Canada. 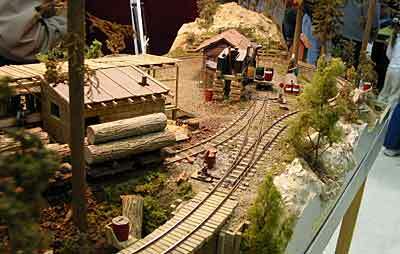 The theme is Canadian west coast logging, specifically on Vancouver Island in the 1920s and 1930s. 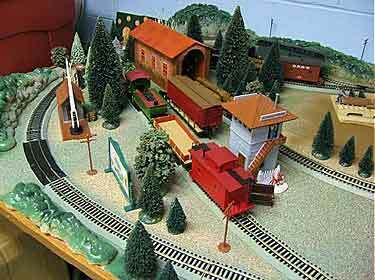 The layout was designed from the beginning to be used at train shows, so an oval (above left) is used to keep trains moving for the spectators. The S-curve in the middle, however, despite its tight radii, allows passthrough of trains from one side to the other, through the central backdrop. This is the secret of the “loads in, empties out” operation. The featured operation is illustrated in the photos below. 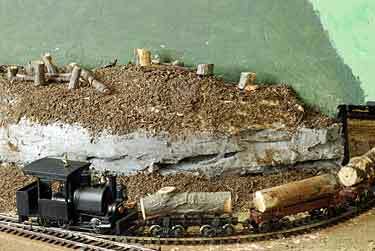 From the log loading side (left photo) the Bachmann Porter loco shoves a cut of log loads through the backdrop portal. On the opposite log-dump side (right photo), the cars are unlooded, and the empty cars returned to the other side, where they’re reloaded for the next cycle. 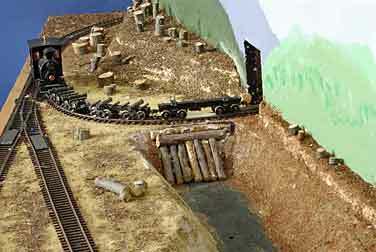 The basic idea is very effective for simulating an actual working railroad. 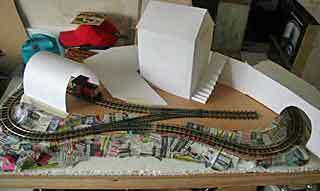 This layout is still under construction, and we look forward to providing more photos as work progresses. 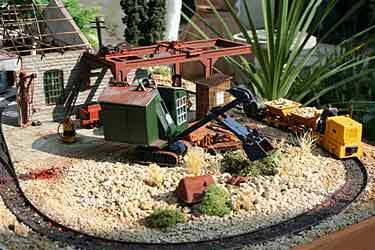 O-16.5 (1:43.5) — QUARRY LINE ROCKS! 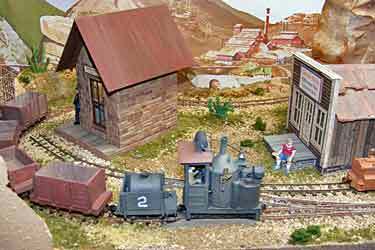 One of the best backstories I’ve heard to justify a relatively plain train set on a concrete slab was invented by John Hanks, from Laramie, Wyoming USA. 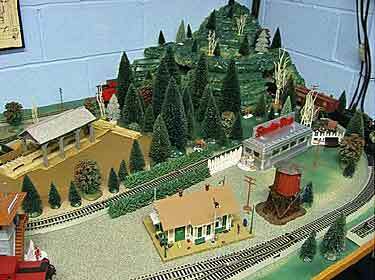 He puts his G scale trains out for the summer to represent a special U.S. Army training layout at Fort Dix, New Jersey. 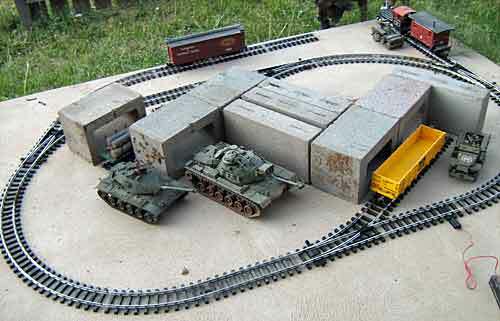 Soldiers are trained in sabotage, anti-aircraft defense, strafing defense and in general railroad skills such as operating a locomotive or building ramps for tanks. 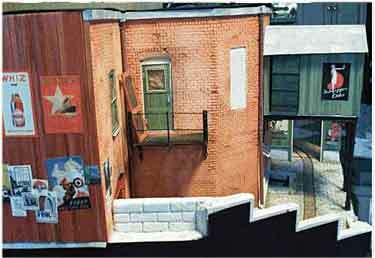 The Army even makes real life simulated towns for training in urban combat—represented here by movable cinder blocks. Remember the Irving Berlin WW2 song, “This is the Army, Mr. Jones”? Make that Casey Jones! 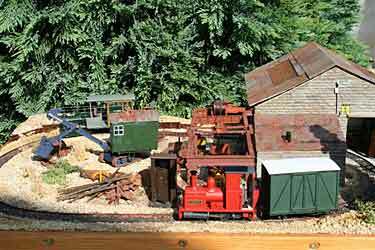 Andrew Milner, from Huddersfield, West Yorkshire, is reusing parts of his atmospheric layout, Arthur Crumb (see Scrapbook #72a), in a new Gn15 line now under construction. Called Upton Ghyll, this one measures 36x16in (90x40cm). The name is a nod to Brian Fayle’s influential Gn15 line, Upton Whent, and—in an even more tenuous pun—to singer Billy Joel. (Incidentally, the red Fordson tractor, also featured in the previous layout, is an all-cardboard model that Andrew built several years ago from a design by Ed Bertschy.) 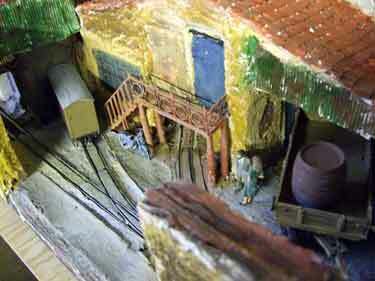 We’ll bring you more photos of this scenic layout as progress occurs. 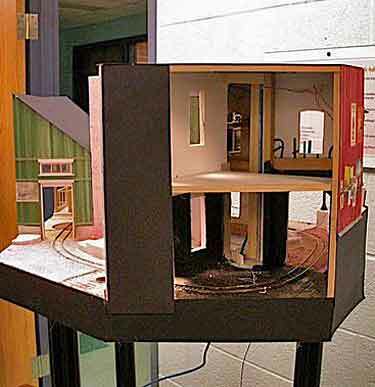 This unusual layout shows what can happen when you start building shoebox-sized layouts! Briton Simon Dawson, a confessed Francophile, explains it thusly: “I liked the idea of building a layout in a shoebox, but my type of layout would not fit so easily, so I started playing around with cardboard fruit-boxes. They are pretty sturdy, having to survive thousands of miles of travel transporting perishable fruit and veg. 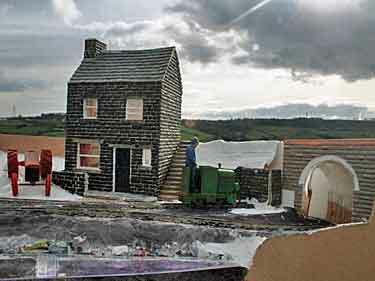 Simon also comments that most of the buildings are made from mashed paper, ground up and pressed wet into molds! 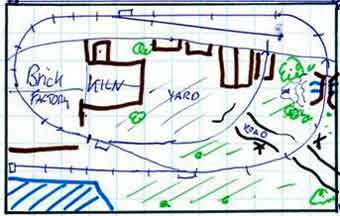 Note that each fruit box section contains a different portion of the line, and all the boxes fit together (with some bare track behind the scenes) to form an oval layout that is well within the size boundaries for a “small” layout. It’s a truly “different” approach! 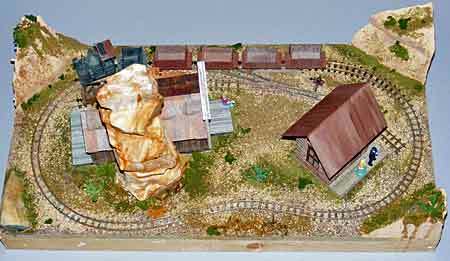 In Scrapbook #76, “The Model Railroading of Art,” one of the layouts singled out for mention because of its artistic, sculptural qualities was Potter & Klayman, created in 2003 by Ian Campbell, from Ontario, Canada. 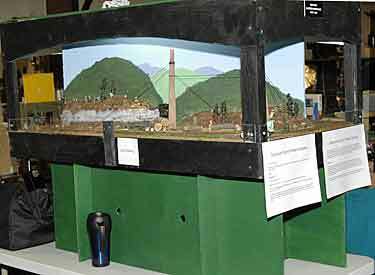 Ian has semi-retired from model railroading, but his friend, Brian Fayle, has exhibited the layout on Ian’s behalf on a number of occasions. 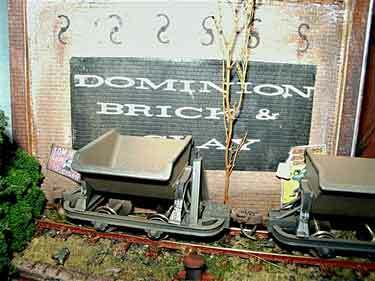 Brian recently dug into his computer files and unearthed a treasure trove of photographs of the layout that he took in 2003, showing the line under construction as well as newly-finished. It’s a Gn15 loop of track, with a turntable at one side. These photos are presented for your enjoyment and reference, to see from all sides how this appealing display was put together. 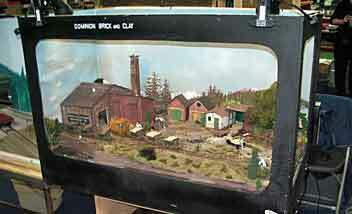 Three possible contenders for the World’s Smallest Working Model Railroad Challenge have appeared in past issues of this Scrapbook. None has yet been entered in the Challenge, however, so this listing is for your reference, information and pehaps inspiration. The first archival very-small layout actually fits the theme of this issue! 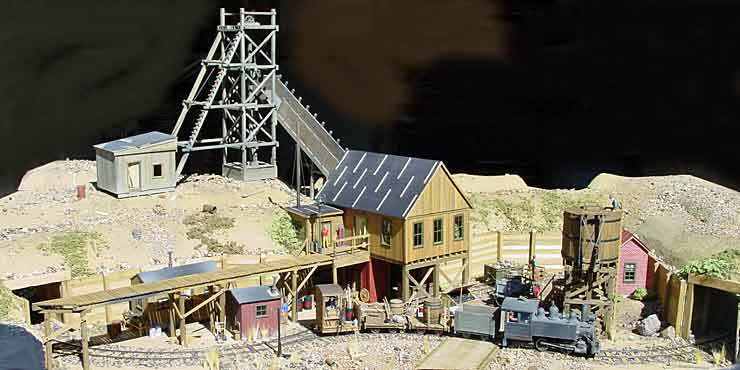 The Silver Dollar Tramway was built as a continuous circuit in On30 scale (1:48 on 16.5mm gauge—widened in this case to 17.5mm to handle the radius). Mike Mackay, who lives in Dartmouth, Nova Scotia, Canada, comments, “The dimensions are 3½x3½in (89x89mm), and the ‘baseboard’ is a piece of 2×4 (51x102mm) cut square. The inner track is a promotional dollar coin, about 32mm diameter. Since the motive power has two solid axles—albeit realigned as shown in the picture (right)—the coin is free to turn in order to minimize wheel slippage. 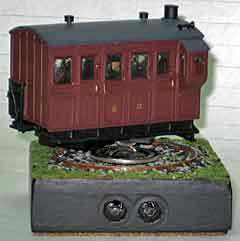 The carbody is a Peco O-16.5 coach; the power came from an old diesel truck.” This layout first appeared in Scrapbook #51. 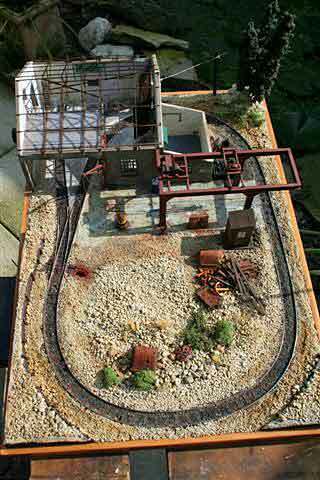 This Nn2 layout, built by Hiromi Masaki, from Yokohama, Japan, is the size of a Japanese business card (90x55mm or 3.5×2.2in). 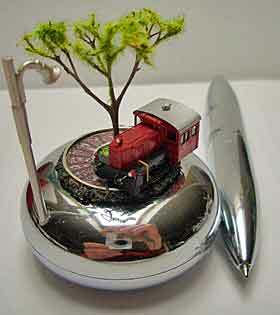 Track gauge is 3.75mm! 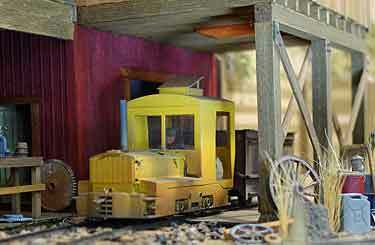 “The yellow skip is freelanced, and the locomotive is motorized to an Nn2 diesel locomotive kit produced by Railino,” Hiromi reports. To see it in action, click on the triangle in the lower left corner of the video screen at right. 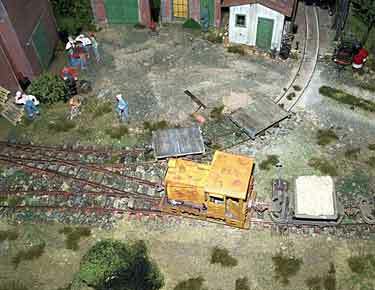 This little line has to be one of the most travelled model layouts in the world. 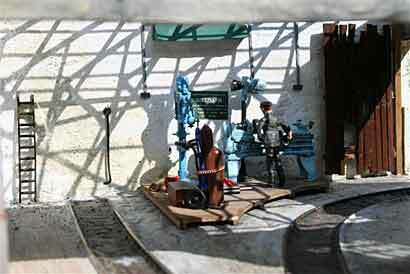 It was originally exhibited at the JAM exhibition in Tokyo. 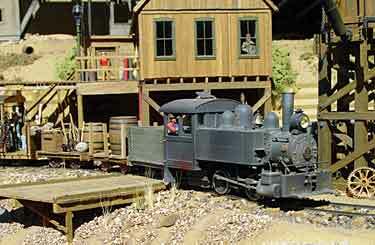 Then Hiromi brought it to the U.S. for the National Narrow Gauge Convention, and then later he sent it to the Expométrique exhibition in Paris! It first appeared on this site in Scrapbook #43. 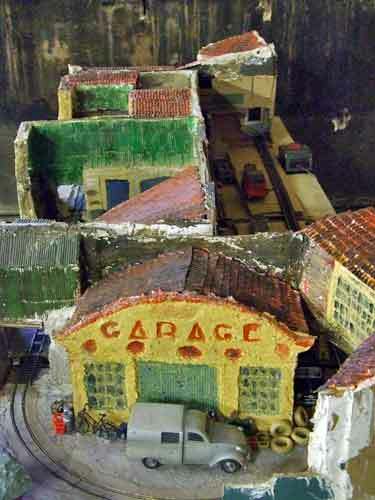 In Germany, Manfred Sobczak created this tiny subminiature pizza layout in Z scale (6.5mm gauge) on a track base fabricated by Walter Völklein. 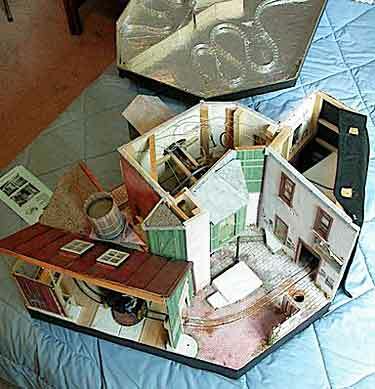 This tiny layout (and its only slightly larger sibling) were shown originally in Scrapbook #72a. Rules and Information, Update 1, T Scale: Terrific or Troublesome?